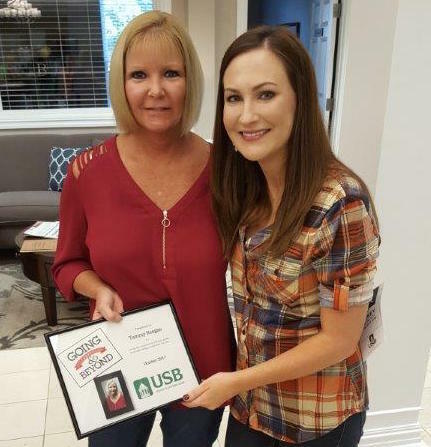 The United Southern Bank sleuths were at it again and this month they’ve caught another employee “CIA (Caught in the Act)” of Going Above and Beyond. Tammy Reagan, one of our Tellers at the Crofton branch, is our October CIA of Going Above & Beyond. She was nominated for going above and beyond since she is willing to and offers to help anyone. She has a giving heart, ready to help anyone with any task and she cares about our customers. Just recently, each of the branches were tasked with asking customers if they would be willing to donate change to Relay for Life as part of Change for a Cure fundraiser. It’s never easy asking people to donate their money but Tammy asked every customer that came through the bank if they would be willing to donate whatever change was left from their deposit or check that was cashed. She truly went above and beyond and ended up raising over $100 just herself for a great cause! United Southern Bank is lucky to have her! We appreciate all our helpful and compassionate employees here at United Southern Bank. Come visit your favorite USB employees at any of our convenient branches throughout western KY. As always, you can also contact us at (270) 885-0056 or (888) 872-0015 (Toll-free) or visit USB 24-7 online.